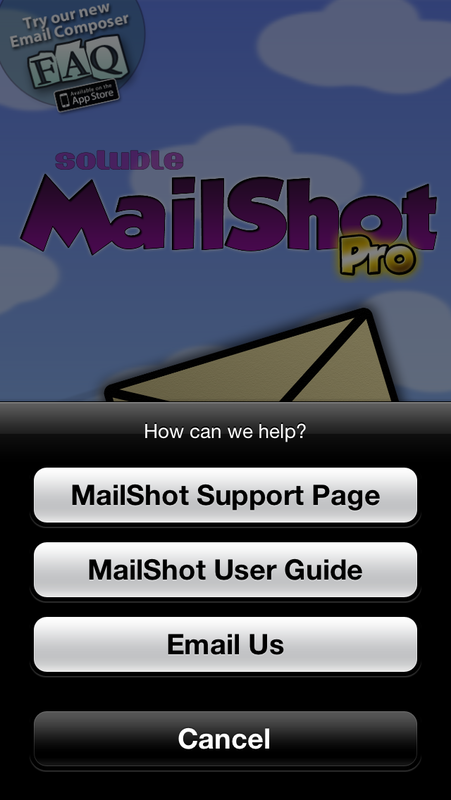 MailShot 2.1 release adds iOS 6 and iPhone 5 support. We have just released a new update to our popular MailShot Pro and MailShot group emailing apps to add iOS6 and iPhone 5 support, as well as a few other tweaks. I hope you find the additions useful, please get in touch via the support button in MailShot if you need any help, or want to report a problem, and we’ll do our best to assist as always. Support for iOS6 Privacy settings. If denied access to contacts, this explains that the user should allow MailShot access to contacts from the Privacy page of the Settings app. Extended screen support. To show and select more contacts at once on iPhone 5. Link email addresses across a series of address cards. This situation is much more common since iOS6 integrated Facebook contacts with your address books. Additional options on the Support button, giving shortcuts to the User Guide and for emailing us, as well as to our MailShot Support page. Emailing us from the support button also includes configuration details for MailShot. This is the preferred way to ask for help, as that information allows us to solve your problems with fewer questions. Prefer iCloud to store contacts when a choice is available, as users have had varying results with Exchange. This will only affect new users. Thanks for your interest and support in MailShot and helping to spread the word. If you find MailShot useful, a refreshed review on the App Store is always appreciated, especially just after an update.